Ever spend ages thinking how you are going to convince someone that a certain task is far from easy, and that they should just give up on the idea – and then the solution appears just as you were about to hit the Send button? You can download the plugin from here. In Trial mode, it can process up to 10 images at a time. … I need to remove text (“Scan_”) from the filename for images I scanned 4-5 years ago (and are now in my LR catalog). It appears [Search and Replace] does not work on filenames, only on metadata. Pre-LR catalog I used a utility to do bulk file name changes on folders of files, but that will be a problem with the LR catalog. I could use the bulk filename changing tool, then delete the LR-cataloged-but-missing-image and then reimport the newly rename files. But it seems risky and I’d lose metadata for the images w/o XMP files. 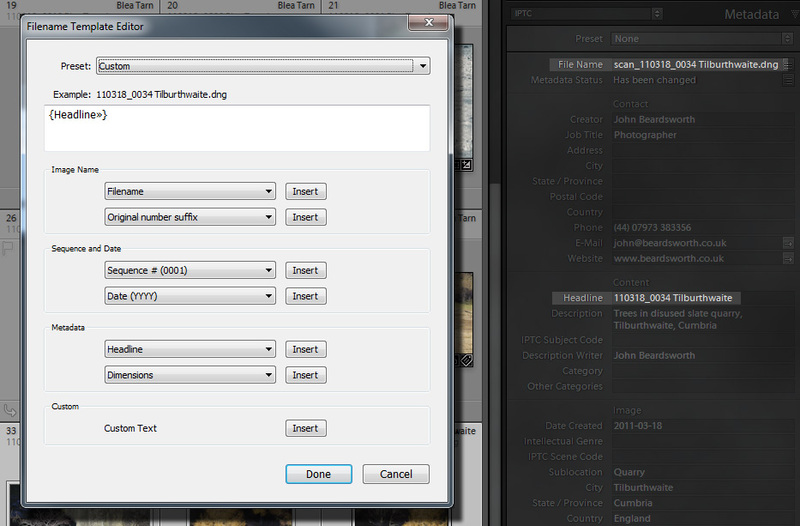 It’s not at all unreasonable that photographers would want to replace text as part of a batch renaming process. It was possible in iView/Expression Media, and Bridge’s renaming dialog box has a similar “string substitution” feature. But this feature wasn’t yet in Bridge when Lightroom 1.0 was launched, and I suspect Lightroom fell victim to “it’s not in Bridge” thinking. Sadly, this omission has never been rectified. Easy. And a whole lot easier than I ever thought it might be! This is really great. It helps solves a problem I’ve been wrestling with for years: how to speedily batch-populate Lightroom’s Title and possibly Caption fields with truncated versions each file name. (My filing system puts a file number in front of “subject” text, and then of course there’s the automatically-added extension.) This technique, followed by using the “Character” section to remove a specified number of characters from the front end, makes it easy. Depending on the length of the file number that may required several passes for a batch, but it’s still far faster than copying and pasting for each image. Thank you for this! Glad you like it! The plugin is a Swiss Army Knife and has benefitted from users’ enthusiasm for the many things one can do with it. Hello, I have used Search and Replace with great success for fixing file renaming in the past. Today I am having issues with certain characters. I am trying to replace ü with u. Search and replace does not see the ü character. Any work arounds for this and other special characters? Is there a way to change the File Name by removing certain characters and replacing with others…. without affecting what is already culled in Collections? When trying to replace in the title “and” for “&” a blank is inserted/replaced. If a use “&&” it will show “&” in the preview, but will create “&&” in the title. Is the a restriction for the “&” not mentioned in the plugin help? I would like to automatically rename all selected images to the name of the Collection they’re in, followed by a sequence number. Can this plug-in do that? I understand that photos can be a part of multiple Collections, so can a photo have multiple captions/titles/whatever, one for each collection it’s in? Does somebody know a way to batch delete one word from fields: Description, title, headline? Great tool. I am searching a tool able to insert in filename some hyphens. I have scanned a lot of old images, other are legacy of grandparents. Now when I sort them, not having the Exif data with the shooting date, the only way I found is via the file name. I tried your tool but I am not able to insert a character in one location. Is there a way? I can’t see an easy way, Francesco, but I think it would be good to add that feature. I’ll see if I can add it quickly. Hi, I would love to have this feature as well! I use the excellent ‘Name Mangler’ on mac for files outside of Lightroom. I’d love to have some more of those features included, especially the ability to remove x number of characters, beginning with x characters from the beginning or ending and then to be able to add [string] at x characters from the beginning or ending. Was this feature ever added? I’d love to see an update. It’s a technique for using the plugin – no need to update for it. I am trying your plugin (several actually) on my LR catalog, including 2,000 film scans. I note that the plugin is updated in advance of the documentation. The above article/comments helped for part. #1 However, would you please explain what the what the purpose of the “Options: People Shown -> Keywords AND IPTC Locations to Keywords on the Workflow Filters Tab do? How is the latter different than the Location Keywords Tab? I want to populate fields (“People Shown” and “Caption”) with the children of my People keyword parent, who are tagged in a given image. If for example an image has KWs People|Tom, People|Harry I would like to populate “People Shown” and part of my “caption” with: Tom, Harry. Now that LR has the face tagging feature, this is more important than ever as people tagging is partially automated. My hard disk is full of past mistakes when it comes to naming conventions…probably due to the multiple sources including recently working to scan great-grandfathers photos! I would love to be able to reset the clock and for all digital images to use a naming convention of ‘Capture Time’ (assume this is the same as ‘date time original’ followed by original filename. Would this plugin work to achieve that or do you know of another option? Not familiar at all with plugins…so sorry for silly question perhaps. It would, but you may not need it. You might be able to rename the files using LR’s built-in renaming feature if those photos have got the capture date in the EXIF or in an IPTC field. Why not make a separate folder with copies of some of the files and see how well you can rename them with LR? If you doesn’t work out, nothing would be lost. Can your Search and Replace plugin access the ‘Original Raw File Name’ field in Lightroom 5? I messed up the rename on import (and convert to DNG) for one batch of images, and I now want to rename the files in Lightroom from the Original Raw File Name data. Looking at the Transfer section of your plugin, I cannot see this data field in the options to select from. Am I missing it, or is it not accessible from your plugin? You may not need my plugin to do this. In the Metadata panel, switch to the Exif and IPTC view. Do you see Original Filename? If so, you can use LR’s standard renaming feature – Original FIlename is available in the Filename Template Editor. Thanks for your reply. Since this did not solve the problem, I have been delaying in the hope of coming back with a solution rather than just a restatement of the problem. Unfortunately it is Original Raw Filename that I need, rather than Original Filename, and that is only visible in the DNG view of metadata. I have solved the problem by using exiftools directly to copy Original Raw Filename to the Headline field. I then cleaned up this file name to just leave the serial number, with your Search & Replace. The Headline field is available in the Lightroom renaming function, so it was then simple to construct the form of file name I wanted, incorporating the orginal file serial number. sounds great! But when trying to do this I struggled. 1. Where shall I use ‘Search & Replace Transfer Command’? Haven’t found it in LR, neither in Exiftool-gui – so where? Ah, it’s a plug-in I wrote – just follow the link in the post above.